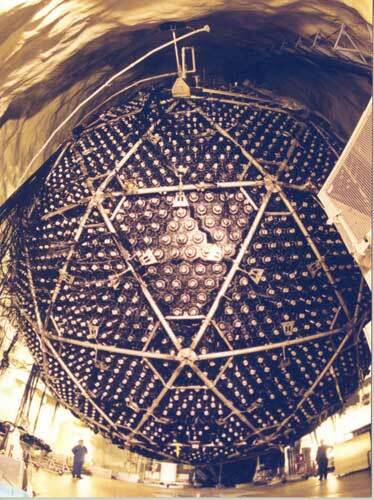 Explanation: Two thousand meters below the ground, a giant sphere has begun to detect nearly invisible particles. These particles, neutrinos, are extremely abundant in the universe but usually go right through just about everything. By stocking this 12-meter sphere with an unusual type of heavy water and surrounding it with light detectors, astrophysicists hope to catch the occasional collision. Since the Sudbury Neutrino Observatory (SNO) is sensitive to all types of neutrinos, future results might hold clues to how much neutrinos change types on the fly, how our own Sun emits neutrinos, and even how important neutrinos are to the composition of the entire universe.